Hello my faithful internet friends. Today is Tuesday but I’m presenting my Monday Brews article anyway. The Monday after Thanksgiving is a family day for us to go cut down a Christmas tree and decorate our house. Thanks for understanding. Fleming’s Scotch Ale: This is my newest homebrew and the first few bottles I’ve had have been quite delicious. It is named after Sir Alexander Fleming, discover of penicillin among other accomplishments. All of my 2013 brews have been named after renaissance men (though Fleming isn’t technically a renaissance man, he was the closest person Scotland has to one). In 2014 all my brews will have a board game related name! Glass Road: While I haven’t yet figured this game out, I know that I enjoy it. It is fun to work with the dials and try to plan my turns the right way so that I can be able to do stuff on my turn. I like the interaction with trying to choose the right cards. And overall I’m satisfied with the game. I may, however, add a house rule that we add a round to the game. Most of the times I’ve played it has felt like I was barely able to get an engine going and then the game was over. Carcassonne: I enjoyed this classic with my in-laws family. We played with the Inns & Cathedrals expansion and the Traders and Builders expansion. I got beat handily, which was annoying since one player kept targeting my areas and trying to either share points or win the majority. Stone Age x2: I introduced this game to my in-laws foreign exchange student from Denmark. He really got it right away and was glad we could play it again before the weekend was over. I really enjoy this worker placement game because it is so accessible to new players. I’ve pondered getting the Style Is The Goal expansion so it can play with 5. Do any of you have any thoughts about that expansion? Is it lame? Good fun for 4 year olds! 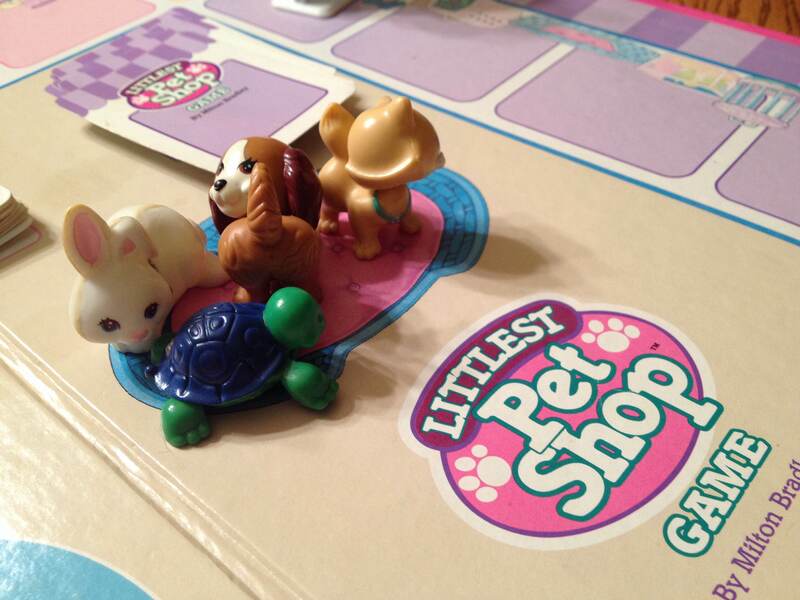 Littlest Pet Shop x2: My 4yo daughter enjoyed playing this game while we were at the in-laws. She kept making up rules to her advantage. I’ll have to teach her about following the rules. But it was a lot of fun to watch her excitement when she earned one of the little animal figures. Kingdom Builder x2: I know this is a controversial title, but I really enjoy the game. There’s a good amount of strategy if you get the right cards. Even when you get bad cards, the game doesn’t last too long. We played with the Crossroads expansion. Undermining: This is another game I like to put in front of new gamers. It’s fun to imagine actually digging down for the precious materials and then using them to upgrade your Universal Mining Vehicle. This game, though, is one where I usually use a house rule or two. One of them is to adjust the scoring for the contracts and another is to have the endgame trigger be the emptying of two contract piles. Fun game though! Compounded x2: Speaking of fun games, the in-laws really seemed to like this game. I got demolished both times we played. I just kept drawing hydrogen and carbon and I needed neither of them! Oh well. It’s a really fun game and I’m looking forward to the next time I get to play! So overall it was a pretty good gaming week! I actually made some game design progress this past week as well. While I was at the in-laws I sat down for a while and worked on Brooklyn Bridge. I like the overall concept that I’ve put in the game, but some of the details about how it works are a little too thematic. So I’ve decided to step away a little from the theme and make the game more fun, which is always a good thing. I have a little up-front work to do to get the game playable, but I’m hoping that I can do some great first playtests around mid-January. So those are the Boards and Barley that I enjoyed and the design progress that I made in the last week. What did you enjoy? Posted on December 3, 2013, in Monday Brews and tagged board games, carcassonne, compounded, in-laws, Monday Brews, stone age, thanksgiving. Bookmark the permalink. 1 Comment. Gotta get Compounded to the table myself! Nice post, enjoy reading them!